Separate score notices printed on secure paper for each section of the exam you indicate below. Official Candidate Score Summary listing every score you have received. 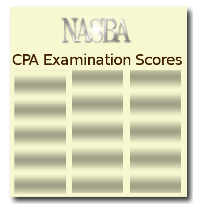 Each score notice also shows credit status for the other examination sections you have taken. A credit status of ATTENDED indicates your score information for that section has not been received. Please be certain all information is correctly entered when submitting your order to prevent delays in processing and delivering your score notice reprint. Please allow 5 business days for complete processing of your order. Due to the customized nature of our products and services, the NASBAstore maintains a strict No Refund Policy for domestic and international orders. All sales are final. For more information please see the Refund Policy section on our homepage. If you took the exam under a different name, specify here. If your state is not listed, contact your board office.